Hello, traders. Welcome to the fifth module of the Advanced Technical Analysis course: Trending Indicators. In this lesson, we are going to teach you how to trade with the Andrews Pitchfork. What is the Andrews Pitchfork? 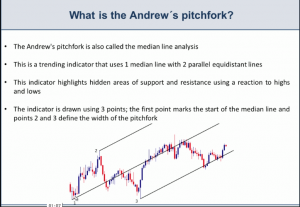 The Andrews Pitchfork is also called the median line analysis. This is a trending indicator that uses one median line with two parallel equidistant lines. This indicator highlights hidden areas of support and resistance using a reaction to highs and lows. The indicator is drawn using three points. The first point marks the start of the median line. The points two and three define the width of the pitchfork. The first point also defines the slope of the pitchfork. And, here’s an example of how it looks in your chart. As you can see here, we have picked this lowest point as number one, this high as point number two, and this low as point number three, and the indicator is drawn in our charts. And as you can see, price is trading along side the median line. The equidistant line is acting as support. Now, in order to draw the Andrews Pitchfork, we must choose three points. Point one is the start of the move, point two is the high, and point three is the low. The pitchfork must be confirmed and the confirmation we are looking for is for price to test the line that forms from point three. In an up move, price must test the line as support and in a down move, price must test this line as resistance. Once we have confirmation that the pitchfork is in play, we can start to look for entries. Now, here is the same example as before. As you can see, we chose this point as the start of the move, which is the start of the move because we were actually in a small down move and here we started to trade up. Now, we chose this high as point two because this is the high of the move before the correction, and this is the low of the move before we started to move up again. And here, we have the confirmation. So after we choose one, two, and three, the pitchfork is drawn but we need price to test this line as support in an up move and as resistance in a down move for us to get confirmation that the pitchfork is in fact in play because if we draw the pitchfork and we don’t get confirmation that it is correctly drawn, we are going to have fake set-ups and we are going to lose money because we are going to think that the pitchfork is giving us hidden areas of support and resistance when in fact, it is just drawn incorrectly. Now, the set-ups we are going to be looking for are these. We are going to look to sell at the pitchfork stop. The stop losses should go above the high and the pitchfork line. This is an example of where we are looking to sell. As we see here, we correctly picked point number one, two, and three because the pitchfork was confirmed when price tested this low or this line of support. Then, price came all the way up to the pitchfork stop and here, we can sell and start taking profit, maybe, at the median line and of course, full profits at the bottom of the pitchfork. Even though we are in an up trend, the pitchfork gives us a channel that we can play in. And, we are going to look to buy at the pitchfork’s bottom. The stock loss should go below the low and the pitchfork’s bottom line. Because the pitchfork is a trending indicator, whenever we have a pitchfork break up, we should counter trend trade-offs. Now, here is an example of where we can look to buy. We picked this low as the start of the pitchfork; the high and the low of the pitchfork was confirmed right here. As you can see here, price tested or barely tested this line again as support and rejected it with this huge red wick and a small bodied candle. When this happens, we can go long, take profit at the median line, or take partial profits at the median line, and full profits at the top of the pitchfork. Now, this is basically how you trade the pitchfork or the median line with any asset actually that you want to trade and this indicator works in any time frame and with any financial asset. And, if the pitch fork is too steep, you should actually modify your median line until you get a pitchfork that is being tested and that is being confirmed with the test of the point three line.